The Britax Marathon ClickTight utilizes the ClickTight system that makes installation virtually foolproof and removes the need for extra strength out of the equation. We think the Marathon is a good-looking, high-quality seat that is very easy to use. The fabric is friendly and durable, the plastic shell is stylish and keeps straps contained, and the non-rethread harness adjustment can be done with your baby in the seat. However, it isn't the best choice for city dwellers as it is heavy and not suitable for carrying very far. It is also expensive and the crash test results are below the average in this review. The ClickTight installation may still have you considering this stylish option. If so, we suggest the Britax Boulevard ClickTight ARB which scored significantly higher overall and only costs $10 more than the Marathon. Britax has around for over 70 years in Europe. Starting in 1939 from British Accessories the company joined Romer in Germany in 1971 and launched their first safety seat in 1973. Britax went on to acquire other companies with a focus on safety seats in Austrailia and New Zealand. In 1990 Britax worked with other international organizations to develop the IsoFix, which becomes the foundation of the LATCH method that emerges later. Britax brings their first safety seat to the US in 1996. They go on to introduce a convertible car seat, booster, and infant seat to the market. 2002 bring the LATCH anchors and continued improvements for safety and installation ensue. Britax also makes strollers and accessories. The Marathon ClickTight is a high-quality seat with impressive performance in most metrics. The Britax Marathon ClickTight (in blue) is part of the ClickTight lineup from Britax that incorporates the ClickTight technology for easier installation. This method helps all ClickTight seats when it comes to ease of installation which impacts the overall score. Every seat for sale in the US must meet or exceed the Federal guideline minimums outlined in the FMVSS 213. However, some perform better during professional testing than others, indicating a possibility for an additional margin of protection. The Marathon results, as recorded in crash test dummy sensors, indicate that the Marathon results are basic and below the average for this group of products. The head sensor results (HIC) for the Marathon was 371, where the maximum allowed is 1000 and the lower the result the better. The chart below shows this result in comparison to the best HIC score in the group of 186 for the Britax Allegiance. The Britax Marathon HIC result is almost twice that of the Essentials by Britax Allegiance where a lower result is preferable. The chest clip result for the Marathon of 48 where 60 is the maximum allowed and lower is better, couldn't compare to the Clek Foonf result of 33.4. The chest sensor results (g clip) for the Marathon was 48 where the maximum allowed is 60 and once again the lower result is better. The graph above shows the Marathon results compared to the best result in the group of 33.4 for the Clek Foonf. The analysis of sensor results and the comparison of the data to the competition earned the Marathon a 5 of 10 score, which is below the average of 7 for the group. In contrast, the more affordable Britax Emblem and Britax Allegiance had scores of 8 which means that parents can find a more economical solution with an additional margin of protection. This seat also includes an anti-rebound bar (ARB) for rear-facing installation. 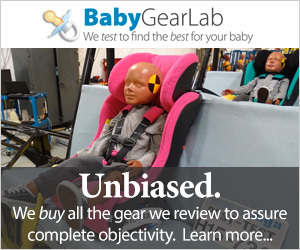 Our preliminary test results with infant car seats indicate that the ARB does help reduce the sensor results, and is, therefore, a potentially beneficial safety addition. The LATCH installation of the Marathon includes the ClickTight technology which makes installation virtually foolproof earning it a 9 of 10 for this metric. The seat installation includes threading the LATCH strap, attaching them to the car anchors, and closing the seat bottom to tighten the strap. If the ClickTight emblem on the front is once again horizontal, you know it is installed correctly. Read the manual for complete instructions. The more basic clip style LATCH anchor seems oddly placed on this higher end seat. However, it is safe, just harder to use than the push button style we prefer. The Marathon has clip style anchors which are basic compared to the easier to push button anchors we prefer. Both are safe, but the button style is easier to remove. The Marathon has a ball style level on the base of the seat. This level helps parents find the right angle for proper installation. The Marathon has seven different recline positions that help parents find the correct installation angle for the seat based on the weight and age of the passenger. With the ClickTight methodology, the Marathon is easy to install by any method and earns a 9 of 10 for installation using the vehicle belt. While not as impressive as the Britax Advocate ClickTight or the Britax Boulevard ClickTight, we suspect parents that don't install car seats for a living (like we do) won't notice the difference. To install this seat in the front-facing configuration you need to lift the seat up (above left), thread the belt across the back and push the seat down to tighten the strap (above right). While not truly a belt lock-off, it does help stabilize the seat on the vehicle belt to avoid movement. The rear-facing configuration of the Marathon incorporates the ClickTight seat bottom and an anti-rebound bar (ARB). For the rear-facing connection, the belt will thread lower on the base but the seat bottom still works the same by raising and lowering to lock the seat in place. The Marathon is very easy to use and tied with several other products, most of them made by Britax. This Britax option is as easy to use as the other Britax products we tested in this review, and it earns an 8 of 10 for this metric, which is the high score in this group. The Marathon ClickTight has a non-rethread height adjustment that works by sliding the headrest assembly up and down. The Marathon harness has 14 height positions and a two-position crotch strap ensuring that almost every child can have a custom fitted harness. The height adjusts with a non-rethread assembly that slides up and down with a squeeze of a button. This task can be accomplished with your baby in the seat for quick adjustments every time. The buckle and chest clip (above left) are somewhat stiff, like all of the Britax options. However, you can work them with one hand if you need to and they are probably stiff to help prevent older children from using them. There is a pull strap at the foot of the base to tighten the harness, and it loosens with a push of the button above the ClickTight emblem (above right). Both work well, and the strap doesn't require exceptional strength to use. The unused LATCH anchors connect under the seat on the base to keep them out of the way. The tether hides in a plastic pocket of its own (above left) for a self-contained unit. The user manual is kept under the fabric on the seat back with a tab label. This location is handy and out of the reach of children, but it could get messy if there are spills or someone gets sick. The cover fabric on the Marathon comes off in four pieces to reveal EPP foam for crash impact absorption. The cover of the Marathon comes off in four pieces must be hand washed only. Britax is pretty serious about this point as the manual has bold red letters telling you not to machine wash. It also must be line dried, so you'll want to plan before washing it. The Marathon ClickTight is a high-quality product with a high quality and comfort score of 9 of 10. While this is the lower-level ClickTight, it is still significantly nicer than much of the competition (above left). With durable materials in a contained design, which works as expected, it is hard to find fault with this car seat. This option has less padding and thinner headrest than the other ClickTight options in this review, but it is well-made, and the fabric is soft. The smooth full contained seat (above right) gives the Marathon a sleek and clean overall look. The bottom of the Marathon is relatively smooth with a rubber anti-slip rim and no sharp edges. The bottom of the seat has a rubber rim to help stabilize the seat and there are no rough edges that could dent or damage your vehicle seat. The Marathon is heavier in the rear configuration thanks to the anti-rebound bar, but either way it is heavier than the average product in this review. The Marathon is somewhat heavy, as are all of the ClickTight products we reviewed earning only 5 of 10 for weight and size. It weighs 27.9 in the rear-facing configuration and is slightly lighter in the front-facing mode. The Britax Advocate ClickTight ARB and the Britax Boulevard ClickTight ARB are both heavier. This car seat is not the best option for parents looking to carry their seat or who plan to use it in the city on public transportation. The Marathon measures 18.2 inches wide making it narrower than some but not as good as others that measure 17 inches. If you need to fit mulitpel people or safety seats in one row, this could be a contender depending on your car. Amazon $309.99 - 16% off!